Most traditional tags in tagging systems such as delicious focus on describing different aspects of the content of resources (what it is about), rather than intent (what it can be used for). In contrast to traditional tags, Purpose Tags focus on capturing aspects of intent, i.e. the different contexts in which a particular resource can be used. When assigning purpose tags, users are assumed to tag a website with a specific purpose or goal in mind. To give an example: When bookmarking the website http://www.facebook.com, a user might tag the resource with a purpose tag “organize a high school reunion”. The intuition behind that is that purpose tags 1) expand the vocabulary of traditional tags and 2) help bridging the gulf between user intent expressed in search queries and the resources users expect to retrieve. To the best of my knowledge, this type of tag is novel, i.e. it has not been studied in the context of folksonomies before, neither in theory, nor in practice. To explore this idea, two students of mine have developed a purpose tagging prototype that I applied in an exploratory study on the subject. This study has produced a number of interesting findings. Most significantly, it shows that 1) users are willing and able to assign meaningful purpose tags in a semi-controlled environment and 2) that the vocabulary of purpose tags seems to differ significantly from the vocabulary of traditional tags. The figure above shows a purpose tag network, and nicely illustrates the difference to traditional tag networks. Where traditional tag networks focus on semantic relationships between tags, the purpose tag network seems to emphasize pragmatic relationships. 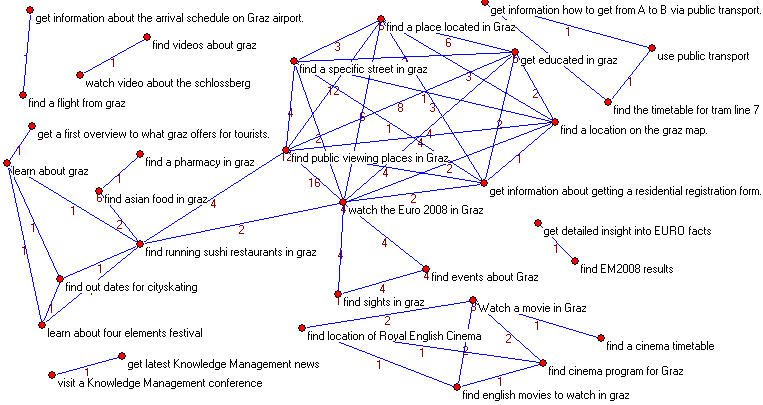 For example, the purpose tag “watch the EURO 2008 in Graz” is related to “find public viewing places in Graz” and “find a place located in Graz”. Whether users are actually willing to assign purpose tags in contemporary social software applications remains open. The results of this study, documented in a paper (Purpose Tagging – Capturing user intent to assist goal-oriented social search.pdf), have just been accepted for presentation at the Search in Social Media ’08 workshop that takes place in October in conjuction with the Conference on Information and Knowledge Management, Napa Valley, USA.